Every time I arrive at this beautiful off the beaten track gem, I feel like royalty! Driving across open farm land, you aren’t sure what to expect, but there’s a treat in store. The old house is stunning and the interior is soft and beautiful. As for the gardens and pool – they take one’s breath away! At Bartholomeus Klip you are surrounded by mountains that turn pink at sunset, farmlands stretching to the horizon, a 4 000-hectare fynbos nature reserve alive with herds of antelope, and a dam the size of a small lake – and yet you are only an hour away from Cape Town, with the winelands of Stellenbosch and Franschhoek within easy reach. You will be charmed by the country friendliness and courtesy of the staff, who take pride in welcoming you to the Victorian farmhouse and showing you to your air-conditioned bedroom, with its period bathroom and beautiful bed linen. The food is special, with lavish brunches and high teas, and a gourmet four-course dinner served in the conservatory. Explore the working farm and nature reserve on foot or by mountain bike, and search for the rare geometric tortoise, or visit the buffalo and quagga breeding projects. Extensive gardens and a salt water pool invite peaceful relaxation. The Deckhouse at the lake’s edge is ideal for weddings and small conferences. Bartholomeus Klip also offers stylish self-catering at Wild Olive House, perfect for families with children, with its own pool and outdoor living spaces. 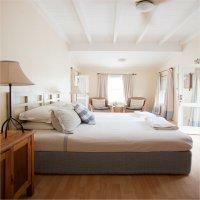 "An amazingly comfortable experience , delicious food,wonderful friendly helpful staff and interesting game drives." "What can I say? Unbelievably we were the only guests for the two nights we stayed at Bartholmeus Klip and were made completely at home for the duration. The wonderful team in the kitchen continued to lay on a spread that could have fed a houseful, never mind 2 guests, and dinner was laid for us specially each evening in the sitting room by the fire so we didn't have to sit alone in the bigger dining area - a thoughtful and delightful touch. The suite was as comfortable as it was beautiful and Johan was both informative and entertaining on the drives and walks we did. We also enjoyed the opportunity to take out mountain bikes and explore the reserve for ourselves, even if we were a little sore afterwards! It was our first visit but I can only hope it won't be our last." Travel out on the N1 and take exit 47, sign-posted as the R44 to Stellenbosch, Klapmuts and Wellington. On leaving the N1, turn left and follow the R44 for 20 km until you reach a 4-way stop. Proceed across the 4-way stop and 2 km later turn left at the road marked Distillery Street/ Wellington/ Porterville/ Ceres (still on the R44). Travel for approximately 26 km until you reach the turn-off on the left to Hermon/Riebeek Kasteel. DO NOT TAKE THIS ONE but be on the lookout as the turn-off is 1 km later on the right, sign-posted Bo Hermon. S33° 28' 20.00" E19° 02' 19.40"